Last week, our patient Mike received his new upper teeth. 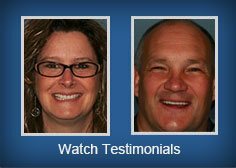 Unable to wear a conventional denture due to gagging and other issues, Mike went for years with no upper teeth. This situation definitely impacted his interaction with business clients and friends. After bone grafting and seven implants, Mike now has solid teeth that enable him to laugh, speak and eat like he used to. These implant supported teeth have changed his life. It was a lot of effort, but all well worth it! Our patient Mike has hope for the future. After going without any upper teeth for several years, and trying to wear different upper dentures, it wasn’t working. His gag reflex was too strong and he couldn’t wear a traditional denture. He thought he would have to live out his days with no upper teeth. That has all changed. Mike is now wearing a U-shaped denture that is fixed in position and retained by seven dental implants. he can smile again with self assurance, eat comfortably and interact with his customers with confidence. Dental implant therapy has changed his life and has given Mike hope for a better future. Dental Implants can dramatically improve quality life! We are in the process of helping a special needs patient who has lost all of his upper teeth. Due to a severe gagging problem, he can not wear a traditional denture and been struggling to speak and eat without any upper teeth. In a few short weeks, this young man will have natural looking teeth secured to six dental implants. He is excited to laugh and to greet people with his new smile. We are currently in the process of helping one our patients replace her upper four front teeth with dental implants. While the healing process is taking place, she has to wear a removable partial denture. These temporary partial dentures can be very uncomfortable for some people. Our patient is counting down the days until enough healing has occurred to allow the placement of her fixed dental implant crowns. She can then feel comfortable smiling again. More and more patients in our practice are choosing dental implants to restore their smiles. They look act and feel like your own teeth. This week, we will be helping another patient who is unable to comfortably wear an upper denture. Multiple upper implants will be positioned in order to secure a small U-shaped denture onto the implants. He will no longer have to worry about which foods he can eat, or about the possibility of his denture falling out when conversing with business clients. This is truly life changing dentistry. 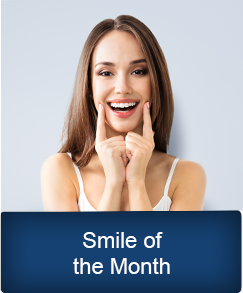 This latest “Smile of the Month” case featured on our website highlights another successful implant case from our practice. The patient was missing three teeth on the lower right and elected to have a custom implant bridge fabricated. Function was completely restored, as the patient can now eat whatever he likes without any concerns at all. Dental Implant look, act and feel like natural teeth. Implants can be utilized to replace one tooth, several missing teeth in an area or all of a patients teeth at once. Our practice is continually helping our patients to replace missing teeth with dental implants. Upon the completion of treatment, our patients realize that implant supported crowns and bridgework feel and look like natural teeth. They can chew food comfortably and be extremely confident when smiling and laughing in social settings. On a regular basis, we are posting new photographs of our patients’ smiles after completion of implant dentistry. Our entire team is excited about a new program that we introduced into our practice last year. We now have a plan specifically designed to make high quality dentistry more affordable for our patients without dental insurance. Many procedures such as Invisalign, replacing missing teeth with beautiful porcelain bridgework or dental implants will now be easier to afford. If you are an existing patient or prospective new patient, call our office and learn more about our Dental Membership Plan. We already have a lot of our patients smiling over this great program. In our dental practice, it’s not unusual to see patients in their eighties and nineties retaining most of their teeth. These patients often have dry mouth syndrome and exposed roots surfaces due to gum recession. This combination often leads to extensive root decay. To combat this and to help our older patients maintain healthy mouths, we recommend that fluoride gel be applied by our hygienist during professional cleaning visits. This treatment can help any adult patient with a dry mouth or decay prone roots prevent loss of tooth structure. The benefits from this fluoride application are fewer root cavities, less sensitive teeth and minimizing the need for root canal therapy. Missing teeth can be a source of embarrassment for many people. The loss of back teeth forces the remaining teeth to work much harder, putting undue strain on these remaining molars and bicuspids. Custom made dental bridgework is an excellent solution to many functional and cosmetic dental problems arising from previous tooth loss. Bridgework is extremely sturdy and comfortable when chewing. We can more evenly distribute the chewing forces with bridgework, which is very important when maintaining optimal dental health. This type of dental restoration can be anchored by the natural teeth or dental implants. These restorations are fixed in place and can not be removed by the patient. For confidence in social settings, fixed dental bridgework is a great choice. Recently, an eight five year old patient in our practice was thrilled with her new smile after the completion of her custom bridgework. She claimed that she can laugh and smile again with confidence. Comments Off on At my age?